My Big Fat Fabulous Life star Whitney Thore, After Her Dramatic Break Up With Avi Lang, Is Dating Someone-Who Is Her New Boyfriend? Home Article My Big Fat Fabulous Life star Whitney Thore, After Her Dramatic Break Up With Avi Lang, Is Dating Someone-Who Is Her New Boyfriend? TLC's My Big Fat Fabulous Life star Whitney Thore is pretty successful in gaining wide support from her fans in her attempt for her weight loss goal. She was really upset when she received "accusatory" messages of not losing weight despite adopting some challenging moves in the CrossFit-style workouts. My Big Fat Fabulous Life star Whitney Thore is not a new name to us. She gained international fame as a fat acceptance movement activist who started an online campaign for promoting positive body image, No Body Shame. She has inspired thousands of women out there who feels insecure because of their weight. She gave them hope and confidence. She is very open up about her body image and health issues but what about her personal life? After her dramatic break up with Avi Lang, is dating someone? Who is her new boyfriend? We have all the details here. Whitney Thore's Personal Life; Is She Dating Anyone Secretly? Whitney Thore gained wide popularity and huge fan followers appearing on TLC's My Big Fat Fabulous Life in early January 2015. The show chronicled her life and her mission to lose weight. The series premiered its 5th season on 3rd January 2018 with cast members including Todd Beasley, Buddy Bell, Tal Fish, Glenn Thore, and Heather Skyes. If you are a regular viewer of her show then you definitely know about how she broke with Avi Lang. The ex-couple was together from September 2016 to March 2017. Her romantic life gone bad was one of the major storylines of Season 4. "This is the most difficult thing I’ve ever had to do on TV. And it’s been one of the most difficult things to watch. It’s deeply personal." "It’s so frustrating to be on TV and know you have an entire life behind two two-hour episodes. It’s really hard because the full picture is never shown." Lang was already engaged to a girl named Nada Louis and was in a relationship with many other ladies. Later, Whitney found out about his various affairs and engagement and broke up with him. Eventually, she organized a support group for the women cheated by Lang. The support group of "over 20 women" worked helping Lang's exes heal. Well, are you people curious about her recent relationship status? We feel proud to announce that she's happily moved on in her life and has found a soulmate. She frequently posts on her Instagram with her mystery boyfriend whose identity is still a mystery. It's all about her courage and strong will power that played a great role to keep everything aside and focus on her new life. We really wish to see her living a happy and a blissful life. Thore has been sharing images and videos of her while doing CrossFit-style workouts on Instagram. While receiving wide support from love fan followers for her weight loss plans, some people bashed her for not losing weight despite her hard effort. "Recently I've gotten a lot of comments and DMs with an…accusatory nature, asking me questions like, 'If you work out so much, why don't you lose weight? What are you eating?' and things like…'If you're going to post workouts and not meals, that isn't fair; we're not getting the full picture." She revealed that she has the polycystic ovary syndrome (PCOS) a common endocrine disorder that often causes disordered eating, depression, infertility, heavyweight loss, and weight gain issues. "For those of you who speculate about my eating habits, I'll give you this. I used to struggle with disordered eating, both purging (but not traditional 'bingeing'; I used to purge regular meals), as well as restricting (eating as little as a few hundred calories a day for months at a time). The last time I engaged in either of these behaviors was in 2011 when I lost 100 pounds and—ironically—everyone thought I was so healthy." Further, she admitted that she's doing her best to manage her weight. Let's support her from all our heart for her weight loss programs. Born on 14 April 1984 in Greensboro, North Carolina to the family of Glenn and Barbara Thore. She attended the Theatre Summer Enrichment Program at the Governor's School of North Carolina of Meredith College. She studied Page High School in 2002. She majored in Theatre at Appalachian State University in Boone, North Carolina. 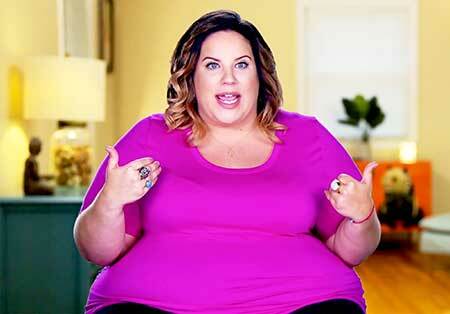 She is best known for her appearance on the TV show 'My Big Fat Fabulous Life' on TLC.